are an opportunity for students from all class years and majors to explore career options, and make contacts with employers. Part-time, full-time, and seasonal jobs and internships are available. 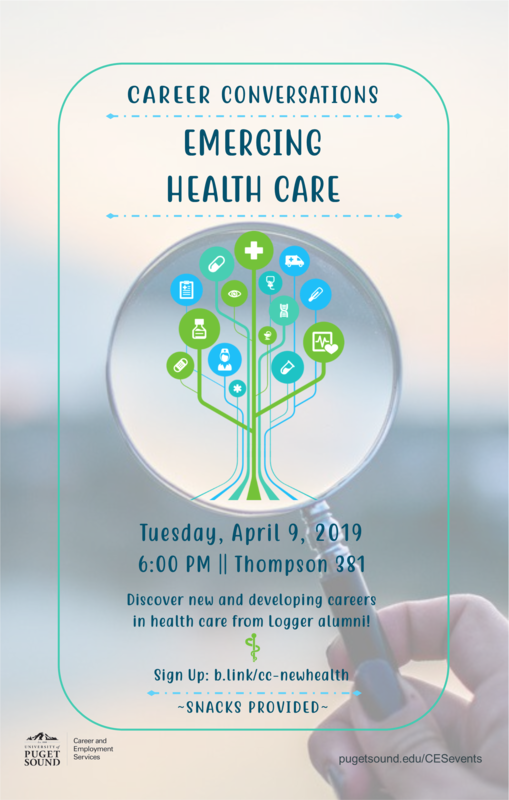 brings together Logger students and alumni to talk about career fields, classes, graduate school, internships, volunteer activities, and other experiences during and beyond Puget Sound. Want to learn about career paths, network with employers and alumni, or build your career skills? Career and Employment Services (CES) hosts, co-sponsors, and promotes a wide variety of events that support students' career development. Check the calendar for updates; schedule changes are bound to occur and may happen at the last minute. Sign in and sign up to attend events via LoggerJobs—you'll receive automatic notifications if changes occur, speed your entry into events, and help us plan for space and refreshments (if provided). Unless participation is limited, like for a tour, you can still attend if you don't sign up. April is Student Employment Month! Appointments available in CES: M-F 8:30 a.m.—4:30 p.m.
Career Advising Drop-in Hours: M-F Noon—1 p.m. Interested in sustainability and social equity? Consider a year of service with a CivicSpark Fellowship! With 90 positions across the state of California, working with local governments to increase capacity to address emerging environmental and social equity resilience challenges, there's bound to be a topic that connects with your interests. **Visit LoggerJobs for details on connecting to the webinar via Zoom** 6—7 p.m.
CES office hours: M-F 8:30 a.m.—4:30 p.m.
CES remains open throughout the summer, with occasional exceptions for holidays or staff training. If you're planning to visit campus during the summer, call 253.879.3161 for updates about closures or to make an appointment. Drop-in hours are not in effect during the summer. Appointments available: M-F 8:30 a.m.—4:30 p.m. Swing by to say hello, pose for a photo op, and bag some swag! Todd Field 5 p.m.
September is International Update (or create!) Your Resume Month! Jump to the front of the line! Pre-register for the STEM and All Industries Career Fairs in LoggerJobs. Then bring your Logger ID card to swipe in for fastest entry. Curious about the world of advertising and creative agencies? Tour the offices of Rusty George Creative in downtown Tacoma and hear from Rusty George himself! The company is known for their quirky, unique approach to marketing and branding. 2:30—5 p.m.
*On Oct. 10 & 11, CES will close at 1 p.m., after drop-in hours, to prepare for the Career Fair. Health Care Friday | ProScribe CANCELLED. Connect with Proscribe at the Career Fair! Take a Logger to Work: Applications are available. Apply now! Take a Logger to Work: Priority Deadline for Job Shadows during Winter Break. Apply now! Recruiters Donna Pham from City Year, alum Vince Ghiringhelli ’10 with Zillow, and Annie Hougland at Sherwin Williams discuss the value of Humanities studies and offer advice on how to pitch your experience to employers. 5—6:30 p.m. in Wyatt 101. Take a Logger to Work: Application Deadline for Job Shadows during Winter Break. Apply now! November is Career Development Month! Looking for a post-graduation job? Consider starting your career by learning about the job search process from the inside by training to become a professional recruiter, like Jayce Ikehara '18. Chat with Jayce about his employer, Aerotek, and hear what he’s learning as he undergoes the training process. CES is closed for these days. Otherwise, CES remains open throughout winter break, Monday-Friday, 8:30 a.m. to 4:30 p.m. with occasional exceptions for staff training. If you're planning to visit, call 253.879.3161 for updates about closures or to make an appointment. Drop-in hours are not in effect while class is not in session. Meeting with a career advisor for a resume or cover letter review? Make the most of your time—bring a printed copy of your document! Want to spend your summer in the Sierra? Logger alumna Danya Axelrad-Hausman '16 is visiting campus to recruit Wilderness Leaders for summer programs at Camp Tawonga. Drop by Danya's table to say hello, and attend her info session to get the details! Check out the Wilderness Leader job description in LoggerJobs. While you're there, let us know if you'll be able to join us at the Info Session. Employers from a wide range of fields will be here to recruit Loggers for entry-level opportunities. Whether you're in your first or final year, attend Career Fairs! You can browse for ideas and practice professional behaviors, or inquire about available jobs and internships. Drop-in Hours are not scheduled this week. Please call for an appointment. CES is taking students on the road during spring break! Logger alumni will lead tours at two iconic Washington employers, Microsoft and Boeing. Sign in to LoggerJobs to learn more and then fill out the registration form. Space is limited! Plan to continue with your current work-study employer this summer? You must apply/reapply for FWS/SWS. Once you receive notification of your eligibility, call CES at 253.879.3161 to schedule a referral appointment. Many federal or state work-study eligible students will return to the same job next year, and CES will confirm those placements with supervisors. For students who want to consider different options, this is your opportunity. Once you receive notification of your eligibility, call CES at 253.879.3161 to schedule a referral appointment. Puget Sound is committed to being accessible to all people. If you have questions about event accessibility, please visit pugetsound.edu/accessibility. Photographs may be taken at campus events for the purpose of promotion. If you wish not to be included, please let the photographer know. Pop-ups across campus: Follow CES on Instagram to see where we're popping up each week! Drop-ins and Pop-ups are not in effect when classes are not in session. Call 253.879.3161 or visit CES in Howarth 101 to schedule appointments. Want CES to present at your class or club?